It is a known fact that buying health insurance for your family, dependent children and parents can help you save tax under section 80D. You can save tax up to a maximum of Rs 1 lakh per financial year if you, your family members and your parents both are above the age of 60 years. However, if you can’t afford to pay for health insurance premium or unable to buy one due to pre-existing conditions, then also you can save tax via medical expenditures. Here is everything you need to know about saving tax via medical expenses. a) The medical expenditure must be incurred either on self, spouse or dependent children or/and parents. Also, the person for whom the medical expenditure is incurred must be 60 years and above. Therefore, in most cases people would be able to claim this only for self/spouse or parents as dependent children are less likely to be in the 60+ age bracket. b) The person on whom medical expenditure has been incurred should not be covered under any health insurance policy. If these two conditions are satisfied, then one can claim a maximum deduction of Rs 50,000 in a financial year for the expenditure incurred. To claim this deduction, all the medical expenditure must be paid in any other mode other than cash. This means that all payments for medical expenses must be done via banking channels such as credit card, debit card, and Net-baking or digital channels such as mobile wallets, UPI and so on. However, one should not get confused between the terms expenditure on preventive health check-up and medical expenditure. Expenditure on preventive health check-up can be done in cash and maximum deduction that can be claimed is Rs 5,000 irrespective of the person’s age. On the other hand, medical expenditure must be done either on self/family members (as defined under law) and/or parents who are aged 60 years and above for the treatment of diseases or ailments. Deduction under section 80DDB can be claimed only for the expenditure done for treatment of illness specified under this section of the Income Tax Act. The amount of deduction that can be claimed depends on the age of the person on whom the expenditure has been incurred. The deduction can be claimed for self or a dependant. However, if it is being claimed for a dependant, then the person should be completely dependent on the individual claiming the deduction. If the person on whom expenditure has been incurred, is below the age of 60 years then a maximum deduction of Rs 40,000 can be claimed. On the other hand, if the age of the person is 60 years and above, then in that case the maximum deduction that can be claimed is Rs 1 lakh. This deduction can be claimed irrespective of whether the person is covered under any health insurance policy or not. 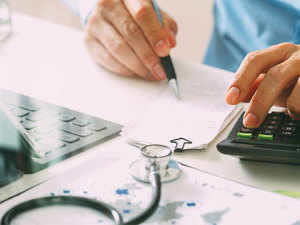 However, remember that the amount of deduction claimed will be reduced by the amount received from an insurer or reimbursed by the employer for medical treatment of the said person. Sections 80DD and 80U deals with the tax-saving deduction that can be claimed for the medical expenditure incurred. Under these sections, deduction can be claimed by a person for himself/herself or for a dependent person. The law defines dependent person as spouse, children, parents, brothers and the sisters of the individual. For both sections, the amount that can be claimed as deduction does not depend on the age of the person. It depends on the percentage of disability of the person. If the disability is more than 40 per cent but less than 80 per cent, then in that case a deduction of Rs 75,000 will be allowed. On the other hand, the deduction of Rs 1.25 lakh will be allowed if the percentage of disability is 80 per cent or more. This deduction is fixed irrespective of the actual expenses. However, remember both these deductions cannot be claimed simultaneously. Section 80DD: The deduction can be claimed for the expenditure incurred on the medical treatment (including nursing), training and rehabilitation of a person with disability. The deduction is claimed from total income of the claimant before levy of tax thereby reducing the total tax payable. The deduction can also be claimed if the individual has paid for/deposited money under any scheme of the Life Insurance Corporation (LIC) or any other insurer or the administrator or the specified company for the maintenance of the disabled dependant. The scheme in which the money has been deposited should provide annuity payment or lump sum amount for the benefit of the dependent suffering from disability, in the event of death of the individual. The individual can also nominate the dependent person suffering with disability or any other person or a trust to receive payment on his behalf. Section 80U: On the other hand, Section 80U provides deduction if the individual himself/herself is suffering from the disability. Previous Post: Looking to save tax in a hurry?